After a 20% decline in insolvencies in 2016, Spain’s GDP growth is forecast to slow slightly in 2017, bringing the rate of insolvencies down to 10%. Despite the decline in business failures, Spanish respondents still seem to prefer using payment methods other than trade credit. Over the past three years, there was a decrease in the total value of domestic and foreign B2B sales on credit in Spain. Based on responses in Spain, an average of 43% of the total value of domestic B2B sales and 32.6% of the total value of foreign B2B sales was transacted on credit. Both percentages are almost in line with those reported in Western Europe overall (domestic: 42.6%; foreign: 35.1%). 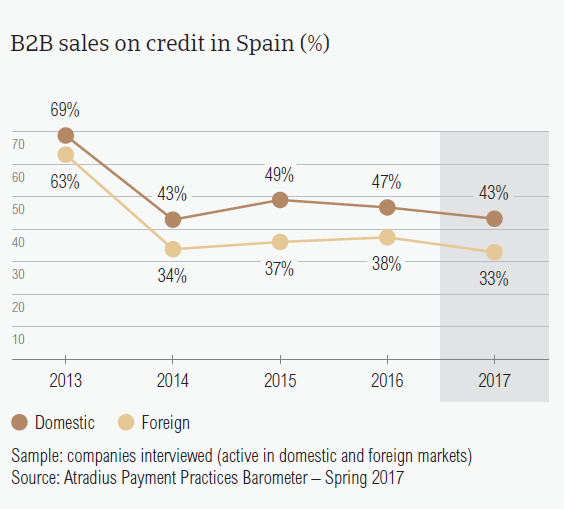 Like their peers in Western Europe, Spanish respondents seem to be more averse to granting credit terms to foreign B2B customers than to compatriots. Compared to 2016 (domestic: 47.3%; foreign: 38.3%), respondents in Spain sold less on credit terms, once more underlining the downward trend in sales on credit terms observed in previous surveys. In 2017, the percentage of invoices paid late by domestic B2B customers increased by almost two percentage points. The average percentage of foreign overdue B2B invoices by foreign customers remained unchanged. According to survey findings, the frequency of late payment in Spain was relatively unchanged since last year for both domestic and foreign B2B customers (domestic: 90.2% vs 89.5% last year; foreign: 84% vs 83.9% last year). There was an increase in the total value of B2B receivables remaining outstanding past the due date. The percentage of domestic overdue B2B invoices increased from 42% in 2016 to 43.8% in 2017. Similarly, the percentage of foreign overdue B2B invoices is higher this year at 42.2% (2016: 41%). Compared to 2016, the Days Sales Outstanding (DSO) figure in Spain decreased five days. This averages 47 days and is three days longer than the survey average. Since 2015, we have observed a decrease in the average DSO. This may be an indicator of increased success in collecting outstanding invoices. 21.4% of respondents in Spain expect a worsening in their company’s DSO in the coming 12 months. On the other hand, 13.6% said that they expect improvement. Despite offering some of the most relaxed terms for invoice payment to customers on the domestic market, Spanish respondents saw an increase in payment delays from their B2B domestic customers. After Greece (64 days) and Italy (56 days), Spain (47 days) offers the longest average payment terms for domestic B2B customers. In 2017, respondents in Spain requested invoice payments, on average, one day earlier than in 2016. Looking at the average payment terms for foreign B2B customers, these went down from 49 days in 2016 to 42 days this year. Consistent with what was observed in Western Europe, payment delays from domestic B2B customers increased. 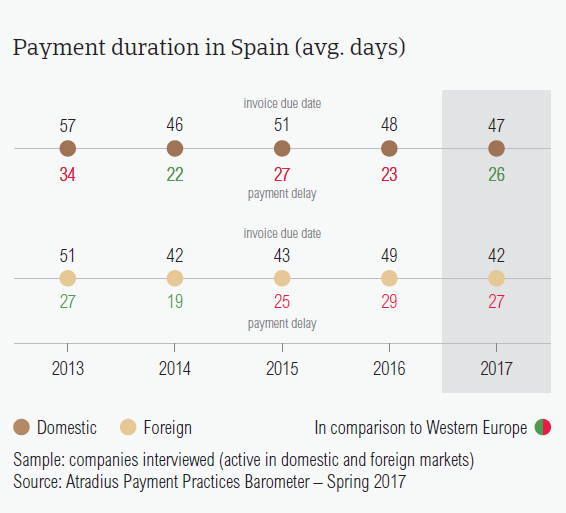 Domestic B2B customers of respondents in Spain settled their payment obligations, on average, 26 days after the invoice due date (2016: 23 days). This is a sign that the speed of domestic payment has decreased. 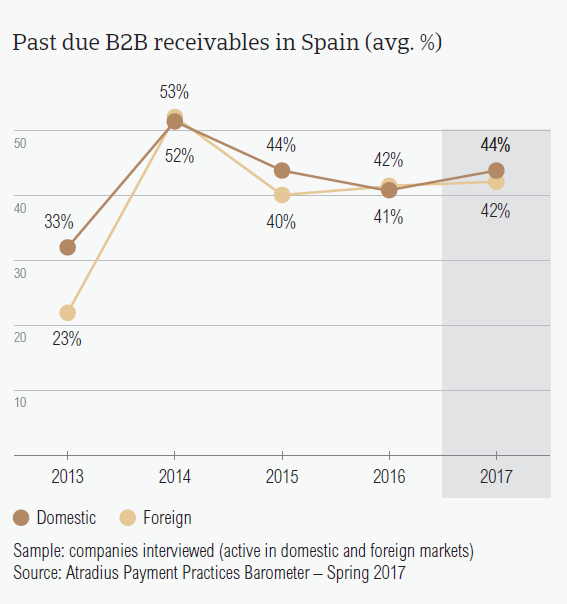 In contrast, foreign B2B customers of respondents in Spain paid their invoices faster, on average, 27 days after the due date (2016: 29 days). Spanish respondents turn overdue receivables into cash in an average of 72 days from invoicing (eight days faster than in 2016). 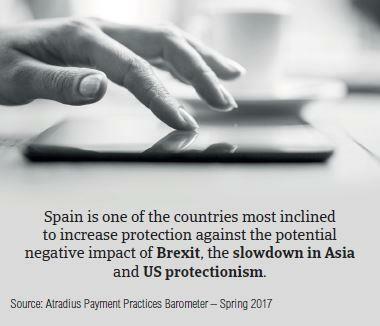 In 2017, respondents in Spain reported liquidity issues as the main reason for payment delays by domestic and foreign B2B customers. However, the percentages of respondents citing this reason went down compared to 2016. According to 52.3% of Spanish respondents, domestic B2B customers delayed payments most frequently because of insufficient availability of funds. Other frequently cited reasons for payment delays were buyers’ use of outstanding invoices as a form of financing (27.9%) and the complexity of the payment procedure (20.8%). 31.7% of Spanish respondents also stated liquidity issues in respect to their foreign B2B customers. The complexity of the payment procedure (30.8%) and buyers’ use of outstanding invoices as a form of financing (28.0%) were the second and third most frequently cited reasons for payment delays respectively. The main reasons for payment delays in Spain are the same as those reported in Western Europe. 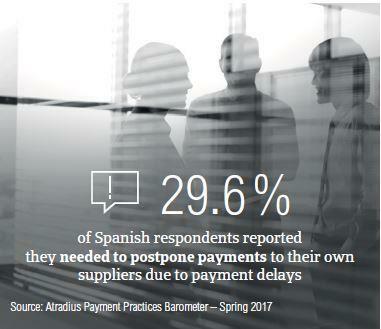 Over the past 12 months, due to overdue invoices, 29.6% of the respondents in Spain had to postpone their own payments to suppliers. 17.0% of respondents said that payment delays led to lost revenues. Next to their peers in Germany (22.9%), Spanish respondents (22.4%) are the most inclined in Western Europe to change their current mix of credit management tools and to do more to protect themselves against the impact of Brexit, the slowdown in Asia and US protectionism. While the majority of Spanish respondents (52.1%) believe that they won’t make any changes to protect themselves against the potential impact of the above-mentioned developments, 22.4% reported that they are likely to take more action. According to Spanish respondents (and similar to what was stated in Western Europe overall), they are most likely to increase checks of their buyers’ creditworthiness (27.9%), the monitoring of their buyers’ credit risk (26.9%) and bad debt reserves (24.7%). Looking at the above-mentioned developments, Brexit seems to be the development most likely to prompt an increase in protection. In this regard, Spanish respondents stated that they will check their buyers’ creditworthiness more often (29.4%), that they will increase monitoring of their buyers’ credit risk (27.9%) and reserve more against bad debts (27.7%). A similar approach is planned in respect to the slowdown in Asia (checks on buyers’ creditworthiness: 28.5%, monitoring buyers’ credit risk: 26.4%, bad debt reserves: 23.6%). The percentages of respondents stating their intention to do more against the potential impact of US protectionism were lower compared to the other two developments. The percentage of the total value of B2B receivables written off as uncollectable in Spain (1.5%) decreased compared to 2016 (1.6%). Still it remains one of the highest among the Western European countries surveyed. Similar to what was observed in previous surveys, and in Western Europe overall, uncollectable receivables in Spain consisted almost entirely of domestic write offs (domestic: 1.3%; foreign: 0.2%), Western Europe (domestic: 1%, foreign: 0.3%). In 2017, the largest proportion of uncollectables came from the construction materials, consumer durables and services sectors. 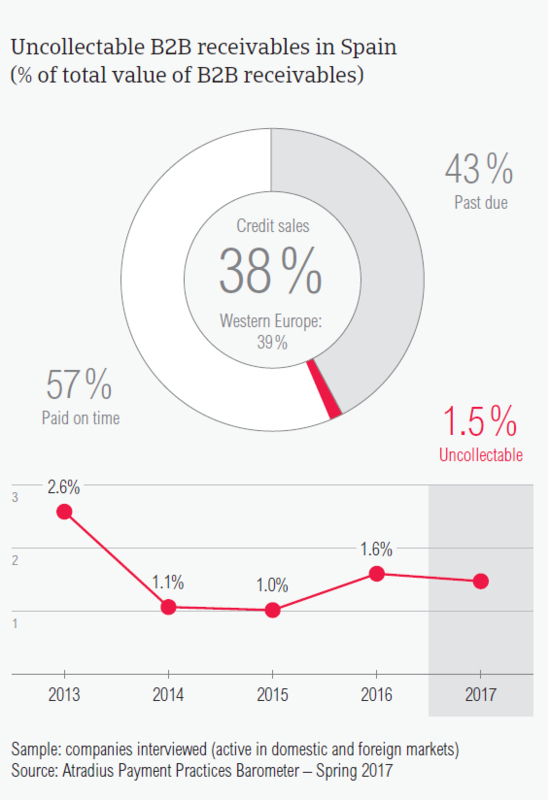 The main reasons why B2B receivables were uncollectable were the customers’ bankruptcy (53.5%), failure of collection attempts (32.3%) and the old age of the debt (29.5%). Most respondents in Spain do not expect a change in the payment behaviour of their B2B customers over the next 12 months. Of those respondents expecting a change, a slightly lower percentage expect a worsening (25%) than expect an improvement (27%). Respondents in Spain offered some of the most relaxed payment terms in Western Europe (45 days). However, B2B customers in the machines (72 days), transport (59 days), metals (54 days) and chemicals (47 days) industries enjoyed more lenient average payment terms. 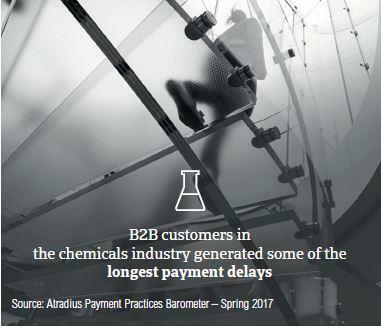 B2B customers in the chemicals industry generated some of the longest delays, settling their payments, on average, 72 days after the invoice due date. Other industries which generated payment delays were business services (75 days) and services (72 days). Spanish respondents stated that B2B customers in the chemicals industry delayed their payments mainly because of insufficient availability of funds (47%). Liquidity constraints was the main reason for payment delays by customers in the services (55%) and business services (41%) industries. Consistent with the view expressed at regional level (58%), most respondents in Spain (46% do not expect a change in the payment behaviour of their B2B customers over the next 12 months.